Wire Cable Railing – Lexco Cable Mfg. Composed of wire ropes, these railing systems are popular in industrial, commercial, and residential applications as they provide an open floor plan increasing circulation and visibility. Both vertical and horizontal cables may be used to replace traditional railing components such as wood, metal or glass spindles, grates, panels, and mesh. Public walkways, parking decks, and balconies commonly employ cable railing safety barriers; they are also popular in marine applications. 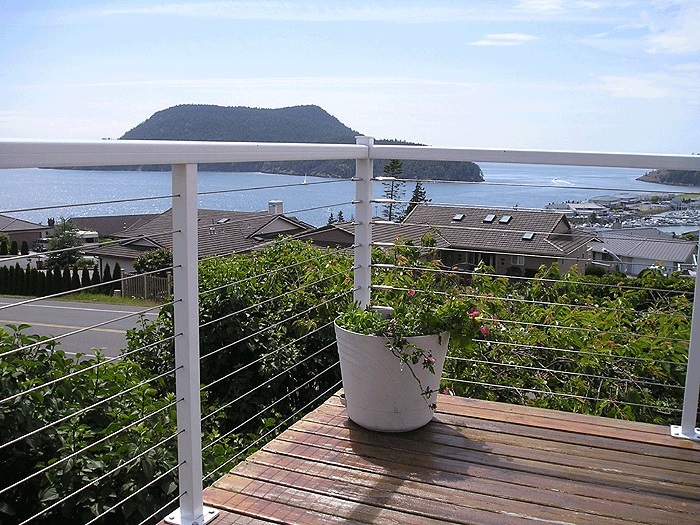 Used as both interior and exterior barriers and fall protection systems, cable railings are commonly made of durable and weather resistant materials such as stainless steel. This results in low maintenance railing with a sleek and elegant look. Material choice, size, dimensions, and finishes are very versatile making this a flexible alternative to traditional guardrails. While the appearance of rails may be important to decorative and personal use railings, workplace cable railing is much more restricted. Such systems must comply with regulations established by the U.S. Occupational Safety and Health Administration (OSHA). This organization stipulates that railings must be able to support 200 pounds, be set 3 inches from the wall and stand 30 to 37 inches from the ground with a mid-rail. Many residential applications comply with these structural specifications as a matter of convenience and structural integrity. Architectural Cable Railing Assembly – Lexco Cable Mfg. There are several basic components applied in the design of a cable railing system. The cable itself has three main elements known as filaments, strands, and cores. Filaments are cold drawn rods of metal materials of varying diameters. These wires are then twisted or braided together to form what are known as strands. Each strand may contain as few as two strands or several dozen. Variable numbers of these strands are then wrapped around the third and final component, the core. Cores can be fibrous or made of wire as well, depending upon the application. The overall diameter of the cables for railing may be as small as 1/8 of an inch or may reach considerable size. The larger the diameter the more rigid, but also more expensive the cable rail will be. These cables of varying dimensions are supported by posts. Made most commonly of metal or wood, these stands may be round, square, or irregular in shape and are predrilled with vertically aligned holes through which the cable rails will pass. Braces on the end posts and mounting plates provide further structural support. The framework used with stranded wire railing must be very rigid due to the force applied by tensioning the cable. The cable tension prevents deflection and can yield great amounts of stress which are placed on the posts. Intermediate posts are placed at varying intervals throughout the railing system to relieve some of the burden from the end posts. 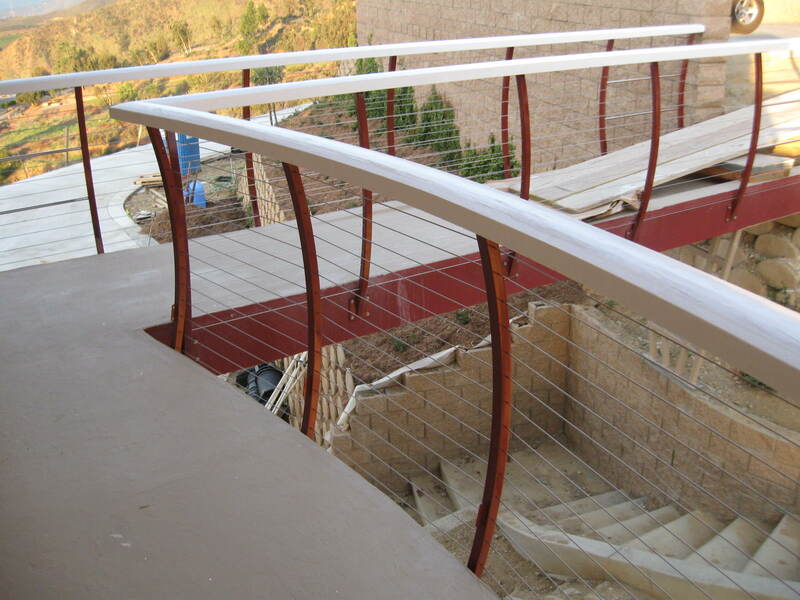 Each component must be carefully designed in order for the cable railing to function effectively as a whole. Cable Railing Cable railings are basic structural barriers designed to establish spatial boundaries and act as safety barriers.